Ruffled light pink and salmon pink bitone. Well branched scapes carry many blooms. Vigorous and colourful. 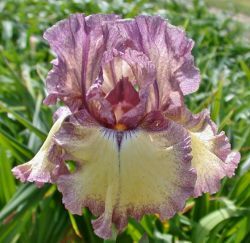 Tightly ruffled lemon flushed blooms with pink and darker veining. Lemon style arms. The entire bloom changes to more pink on the second day. Very ruffled. Huge blooms of coral rose-pink bitone with medium yellow signals. Vigorous. Ivory white with raspberry pink plicata edging. Brick red beards. Laced and ruffled. Limited stock. 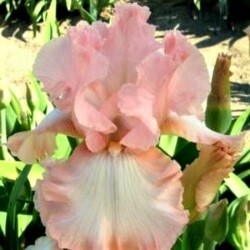 A good quality ruffled pink bitone bloom thought by many to be the nicest pink Louisiana Iris around. Good quality light pink. Red beards tipped pink. Limited stock - 1 per customer. Clear rich mid pink with yellow signals. The large flowers are ruffled and waved. Super quality again. Details : E-M 95cm - 38"
Lavender pink standards, darker violet pink falls and beards. Limited stock - 1 per customer. Deep fuschia-pink blooms with all petals covered with fine veining. An unusual green-yellow "steeple star" signal pattern adds impact. Gorgeous. Light pink with cream edging. The lower half of all the petals have a deeper blushed pink shade to them. Lovely. Low on stock - 1 per customer. Mid pink with coral pink beards. Sweet fragrant. Bright crimson pink standards. Falls deeper crimson raspberry with lighter edges. Vigorous and hardy. 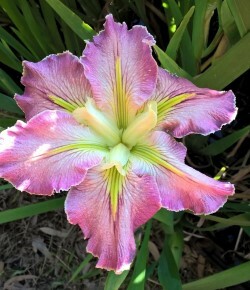 A real standout - makes a dramatic clump. Vigorous and hardy. Limited stock - 1 per customer. Low on stock- 1 per customer. 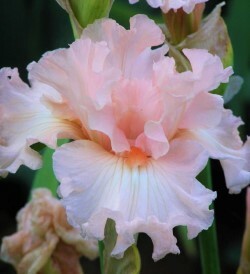 A beautiful mid to light pink with a slightly light pink on falls. Tangerine on pink beards. Ruffled. Details : M 92 cm - 36"
Glowing pink-orchid or mallow pink standards. Falls are paler hazed blue-pink with white bibs around the pinkish orange beards. Wide, ruffled and full blooms. 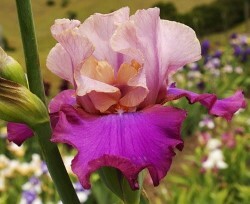 A lovely coloured iris. Limited stock - 1 per customer. Raspberry cream ground with red and purple splashes. Tangerine beards. Unique. Gorgeous pastel pink with pink beards. Nicely branched and budded. Quality. Limited stock - 1 per customer. Details : E 36" Re. Ruffled azalea pink self with mandarin orange beards. Sweet fragrance. Vigorous. 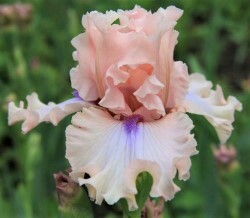 Details : M 95 cm - 37"
Large ruffled cream blooms with smoky mauve plicata on standards and on edges of falls. Yellow beards. Tall and vigorous. Limited stock.